No overclock option in your BIOS? No Problem. Overclocking your CPU can be risky business, however if done properly and with the proper amount of care, it can improve system performance anywhere from 5% to 50% depending on the CPU and how it is overclocked. In this article, I am going to discuss the various methods, benefits and downfalls of overclocking. Remember, ALL forms of overclocking beyond the manufacturers specifications voids the warranty and has the potential of “bricking” your CPU, Motherboard, or both. Therefore I take no responsibility what happens to your CPU/Motherboard if you attempt an overclock. If you are not technically inclined, or feel uncomfortable changing these settings, please give it to someone who is or just don’t try it. Overclocking creates extra heat, so it is a good idea to buy a good heat sink to dissipate the extra heat. The safest and perhaps the easiest way to overclock your CPU is if you have that option in your BIOS’s setup. There are often times the BIOS will contain options to change the FSB (Front Side Bus) frequency or CPU clock multiplier. However, as this article is about overclocking without this feature, I will skip this step. There are several freeware programs out there that work quite well. Some of which are “SetFSB” or “CPUCool” . These programs set the clock rate of a variety of PLL clock chips. You will have to know what kind of chip your motherboard has on board. 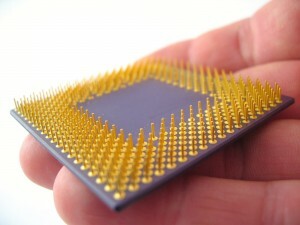 There are tutorials around the web that show how to find what kind of chip you have. Some PLL’s have the ability to be changed and some do not. The SetFSB website has a list of PLL’s that SetFSB supports, and are adding new ones frequently. This method is quite easy to do. All you have to do is download the application, install it, select your PLL chip in the Clock Generator drop down menu, and change the settings. I highly recommend that you raise the clock by 100 or 200 MHZ at a time. If you raise the clock speed too much at once, you run the risk of burning out your CPU or other chips on the board. Also, setting the FSB raises other clocks on the motherboard such as PCI clock and memory clock. Some PCI cards handle overclocking better than others, so that is a factor on how fast you can go. If your computer starts to lock-up, back off the speed about 200MHZ, or until lock-ups cease then that would be your maximum overclock. If you have a PLL chip that is not adjustable, and your CPU is a Core2Duo or greater, there is still hope for you. There is a mod called a “BSEL mod” which requires shorting certain pins on your CPU that modifies the connection between your CPU and motherboard. You can find a tutorial (here). It fools the motherboard into thinking the CPU has a faster bus. However, this mod is for experienced persons only. If you have never done anything electronic, I would recommend to not attempt this mod as a mistake could be disastrous. I understand there are some BIOSes that check the CPUID and configure speed from that. In that case a BSEL mod would not work and you would have to buy a new CPU to get any faster. Lastly, Some CPUs overclock much better than others, and Motherboards vary in performance also, so the amount of overclocking you can do depends entirely on what you are working with.